They're featured in the magazine's Fashionable 50 issue. It's official, as mandated by Sports Illustrated: new couple P.K. 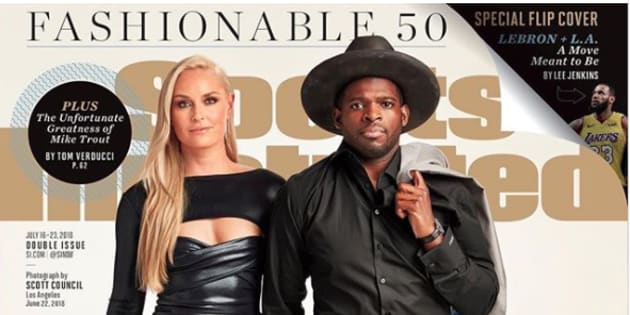 Subban and Lindsey Vonn are two of the world's most stylish athletes. In its "Fashionable 50" issue, the magazine celebrates sports stars who are also known for their personal style. Gone are the days when being a professional athlete meant walking around in sweatpants. LeBron James, also on the list, detailed the Cleveland Cavaliers' involvement with designer Thom Browne, who designed custom suits for the whole team during the NBA playoffs. Other notable athletes who made the shortlist include Genie Bouchard, Serena Williams, and Dwayne Wade. Subban and Vonn are on one of two covers as a couple, holding hands beneath the words "The Perfect Match." The 29-year-old hockey player and the 33-year-old alpine skiier confirmed their relationship when they attended the CMT Music Awards together last month. The other cover features football player Odell Beckham Jr. of the New York Giants in a section that's also well worth a read (describing a memory involving a pink velvet blazer). It's hard to argue with their front-page status as fashion icons. Subban, who has a line of suits, shirts, and accessories with RW&Co, is not afraid of an audacious suit, a bold print, or even an ambitious hat choice. Hats obviously play a big part in his style. "Hats and jackets are probably the most important things," he told Sports Illustrated. Lindsey Vonn, meanwhile, is a little more restrained. She sticks to the classics when naming her favourite designers, telling Sports Illustrated that she likes Armani, Gucci, and Louis Vuitton, "because I have the same initials." She launched a line of casual skiwear with Under Armour in 2017. Her Instagram indicates she prefers high necks, crop tops, and a fashion-forward back or side cut-out. And if somehow you're still not convinced of their fashion credentials, then please take a look at this.